PRICE FOR SUBJECT VESSEL, TO BE UPON REQUEST. Three Masted Sail-Cruiser 175. Built in 1993, undergone major ($ 2.3 million) refit 2001, incl. 2 x new CAT 720 hp engine and generator. 53,5 x 12 x 4.5 m 805 sqm. Remote controlled sails, accommodation for 54 pax in 25/26 ensuite cabins, 16 x crew, 2 x bars, 300 sqm sundecks, 150 sqm lounge/dining area. For sale incl. time charter. DIRECT OWNERS' APPOINTED AGENTS ! 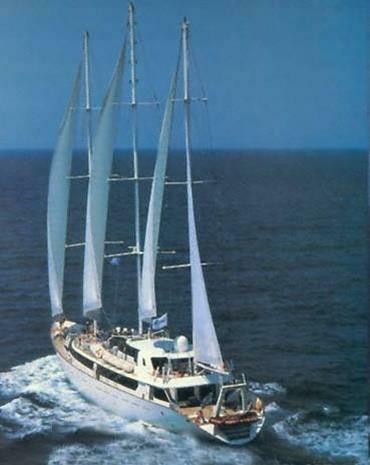 Three-masted sail cruiser with steel hull, commissioned in 1993. 24 guest cabins (9-14 square meters) with double or twin bed arrangement (2 cabins with possibility of a third bed), with en suite bathroom, individually controlled air conditioning, radio and telephone. 2 fully equipped bars on decks. 150 square meters lounge and 28 seat dining area convertible into meeting room. Equipped with satellite navigation and communication systems.